Thanks to the Aerodynamic styling, it really hasn't dated as badly as many 1980s cars. Yep, it's as ugly now as it was back then. Once the pride of sales reps across Britain, with just 7 cars short of 1.3 million sold, what has become of Ford's jelly mould? As a small boy in the mid 1980s, this was my parent's first decent car; after a disastrously rotten Fiat 127 that might have put many sane people off car ownership altogether. The Ford Sierra seemed like a vision of some space-age future. Coming from the Fiat, I was amazed by windows that could open and close without falling out, bamboozled by doors that actually locked and captivated by windscreen wipers that did the job their name suggests. It seemed like a proper car. Okay, it had a pitiful 1.6 litre 74 bhp engine and was all but an aged Cortina under the skin, but we loved it as a family all the same. Later on, when a friend's Dad acquired the XR4x4, I was in love, and wanted one immediately. Unfortunately, so did most crooks, that particular car was stolen at least twice by joyriders to my knowledge. By today's standards, the 2.9L Cologne V6 was nothing special with a mere 148 bhp, but it sounded like a monster risen up from the deep. I still remember being taken for a run at speeds well in excess of 130 mph along some hairy Leicestershire roads. Innocent pre-speed camera times, but madness today! An XR4x4, strangely not being surfed along the edge of a kerb by joyriders at the time of this photo. 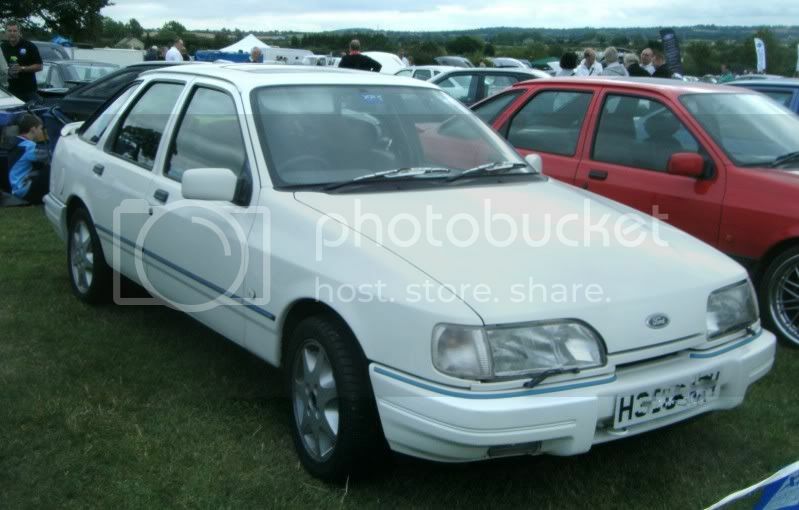 Let's not forget also, how the Sierra spawned a whole demographic label with the targeting of a section of middle classes voters under the name of "Sierra Man" by the Labour Party, which soon became "Mondeo Man" as the 90s progressed. Of the 1 million Sierras on the road in 1995, only 5,000 are still rolling today in 2013. There were 18,000 XR4x4s in 1995, and yet now there's a truly endangered population of just 400 cars on the road. Surely these deserve to be classics and saved? Have a spare garage to fill? Try a Sierra XR4x4. You may even find an unmolested example, unlike the slightly insane Sierra RS Cosworth (and "Sapphire" saloons), which are now down to about 1,000 badly modified cars.